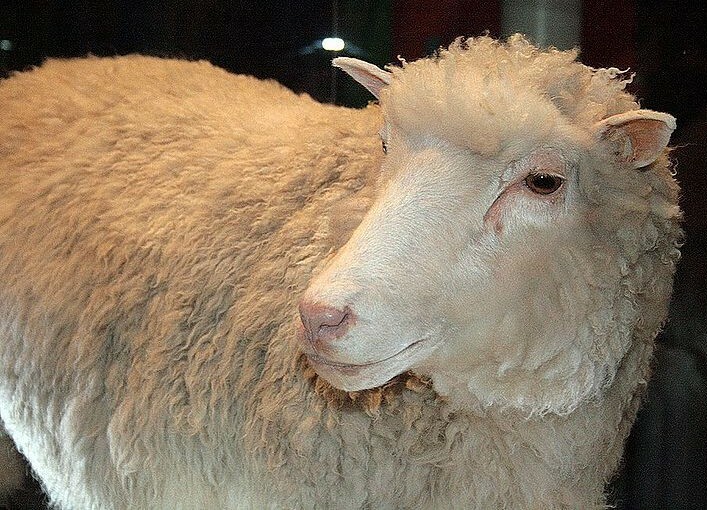 Thanks to Dr. Gurdon’s groundbreaking work, Dolly the Sheep followed Freddie the Frog—paving the way for Snuppy, the world’s first cloned canine: Just a simple tissue sample from his ear shipped to Korea, and voilà!—Snuppy was a duplicate dog. Now that your beautiful Bulldog or cannibalistic Rottweiler can be cloned, why stop here? Cloning R Us is the first in the U.S. to take cloning one genetic step further. It’s easier than ever to purchase physical duplicates for your very own home. Be the first on your block to own a clone! Who can tell when picking a cute kitten from a litter which one will grow up to spit at your mother-in-law, and which one will spend its life hiding on top of your kitchen cabinets? If you prefer the type of cat that acts like a dog, clone kitty now…only $55,999, and you’ll be buying Kitty Litter for another fifteen years. Spayed cats are perfect for cloning since tissue samples needn’t have reproductive cells. The same goes for humans. Just go to Petco and replace that dead hamster with a live carbon copy as convincing as a clone, for under $10. Depressed about your mother dying? Despondent that no one will make you chicken soup when you have a cold, no one will criticize you for marrying the wrong spouse, no one will refill your checkbook when you can’t pay for the Porsche you leased before the market tanked? Well, grieve no more! We’re running a cloned-mother special for only $75,000 (under age 65), $65,000 (age 66-79) or a price value option of $49,999.99 (octogenarians only). Bring in your friend’s mother for the two-for-one special from now until Mother’s Day. Certain brands are excluded from this special offer including Mothers with Designer Handbags, Permanently Reduced Mothers, and Mothers with Gift Cards. Tired of having a mother who calls from Florida to make sure you have enough canned food during a one-inch snow-dusting in Bethesda? Our exclusive Clone Someone Else’s Mother is perfect! Choose from: Emotionally Repressed WASP Mother, Recovered Alcoholic Irish Mother, Non-English Speaking First Generation American Mother Whose First Born Got a Free Ride through Harvard Medical School, and Savoir Faire Mere, guaranteed to whip up perfect soufflés at every meal. Surrogate mother clone options are subject to change, based on availability. This item has been discontinued, due to Deadbeat Dads, Dads who Left Dirty Socks in the Living Room, other DNA defects, and protests from Ms. Magazine that there are already too many men ruining the planet. We’re also in a class action suit from a Football Dad mis-order, who turned out watching PBS ballet recitals 24/7. Is your first-born showing signs of Ivy-League potential in preschool? Has your two-year-old’s soccer coach assured you he’s destined for World Cup 2026? Our pediatric specialists keep Junior giddy during the biopsy. Why be bothered with more morning sickness, weight gain, and C-section scars? Build a better family now. A permission slip from your analyst is required. Photo required for approval. Are you a Social Worker who’d rather be a CEO but don’t want the hassle and expense of getting an M.B.A.? Want to force your first-born into the boring but profitable family business instead of backpacking through Tanzania? Soon to come: Clone Your Career! Terms of Sale: No down-payment required. All major credit cards accepted. No phone orders. Free shipping if cloned specimen weighs under 100 pounds.